Please add a stone to cart for a ready to wear ring. Normally ships within three weeks from order date. Choose a Center Stone Instructions Set with round stone I will add to this order	Ship ring only, no center stone. Please specify the measurements of your stone in the Special Instructions at checkout. Our reproduction is based on an 1895 Cartier ring for round center stones, with a few updates to improve upon the original. Our reproduction provides a stunning look whereby the upper half of the ring appears to be made almost completely out of diamond. 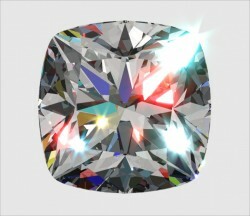 (we use extremely well cut, VS1-VS2, F-G color natural diamonds). Prongs can be clawed by request, simply leave a note during checkout requesting claw style prongs. Our 1895 Cartier-style Reproduction ring is available for round center stones only, and for center stone sizes measuring approximately 6mm up to 13.5mm. We've also added an interior comfort fit shank, and twinned prongs to accentuate the round center stone. The end result is a ring that has become one of the best selling rings we've made to date. "... I love my BTD Cartier Repro setting! I have actually had 3 people say that my ring is the most beautiful ring that they have EVER seen!" Video showcasing our 1895 Cartier Reproduction ring. Center stone is a 2.98ct E/IF Amora Gem, the ring is HPE palladium and a size 6. This reproduction is 'band friendly' and provides a flush fit for most wedding bands, including our matching wedding band designed expressly for this reproduction. 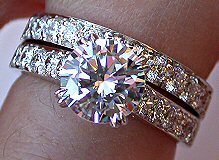 Wedding Set options: If you are interested in creating a knockout look with 1ctw of natural diamonds on your finger, consider adding the .55ctw matching wedding band. The band sits flush, and can be used on either (or both) sides of the ring. Details regarding the matching wedding band for this Cartier-style reproduction ring are here. Even more impressive - our 1895 Cartier-style Reproduction Ring, when ordered in Platinum or Palladium, is among the only rings available in the world that are 'High Pressure Enhanced' after casting. This cutting edge high pressure process causes densification to the platinum and palladium yielding a finished ring up to 20% harder than normal platinum or palladium! 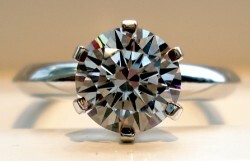 Note that among the many details, we also polish the inside of the prongs before setting your center stone. A small detail and one that most jewelers ignore, but our goal is to deliver the finest ring possible to you. Photo showing "claw" style prongs, available by request. Please note that this is for the ring, side diamonds, and surprise diamond only, or effectively a finished ring with no center. For a ready to wear ring, please select an appropriate round center stone (6mm - 13.5mm rounds only) and add it to your cart along with the ring setting, then follow the prompts through the checkout process. 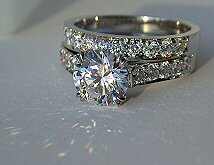 Or, if you have your own center stone that you would like to have set locally, please specify the measurements and weight of your center stone in the 'Order Instructions/Comments' section during checkout so that we can send you a ring mounting that has the correctly sized prong head to fit your stone. We will automatically size and assemble into a finished ring for you. Our Asha® H&A Rounds page is here and our Amora Gem Eternity H&A Rounds page is here. Surprise top grade, natural diamond on the underside. Even the inside of the prongs are polished to ensure maximum shine from every angle. Height of stone off of finger: A 9mm round sets 7.75mm high. Please add a center stone to your cart for a completed, ready-to-wear ring! This item is the ring mounting only (ring shank with side diamonds, and prong head). Center stone is not included. I received my Cartier 1895 reproduction ring today set with a 1.81 ct F IF Amora and I am thrilled. 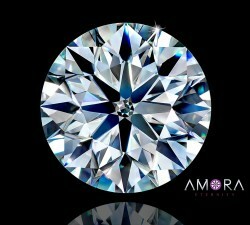 The Amora is bright and clear with fantastic brilliance and fire. 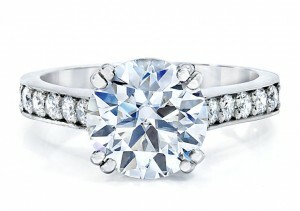 It is a great balance between side stones and a plain solitaire. I find that many of the designer halo settings take too much attention away from the main stone and with an Amora you would never want to do that. This ring looks like a Cartier but only better. 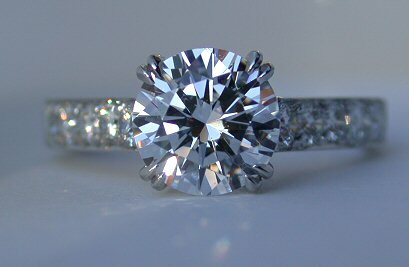 I love the double prongs and the surprise diamond. 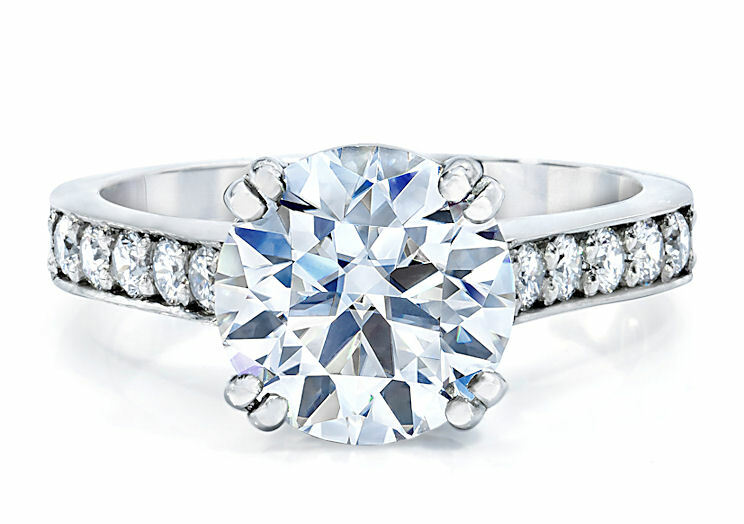 If you are looking for classic, timeless elegance this ring is for you. Thank you BTD for creating such a beautiful classic setting with superior quality. thank you so much for such beautiful rings. i am so happy with them. i lost my engagement ring over a month ago and now i feel married again, in fact it is even more beautiful than my natural diamond. thank you again! My fiancée proposed in December 2010, then let me choose my own engagement ring. I spent 2 months searching everything available in our local shops and everything I could possibly find online. I fell in love with this ring, the 8 prong setting, the classic style, but especially the size, cut and clarity of the side stones. I purchased the Platinum setting and then went my own route and had a 1.69 ct (near-colorless) light violet-blue sapphire set as the center stone. My ring is absolutely stunning and I constantly get compliments. Thank you BTD! I can't wait to get the matching band! I surprised my wife with this beautiful ring in Dec 2006. She receives compliments all the time - which really is the true measure of how stunning a ring is. I like how the double prongs make the ring unique in its own right. 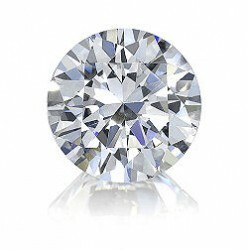 My wife has a 1.1ct round Whiteflash “A Cut Above” H&A stone in the platinum setting and she likes how flush it sits to the setting. Lesser quality settings lift the stone off the ring. The ring has held up well and to this day she still brags about how good a job I did picking this ring out. work just because it looks so nice. shipment of the rings. Your service is excellent. to buy from anyone else.